We love the style and ambiance of the main lodge’s open lounge and deck area, where old tree trunks hold the thatch roof up and which is gorgeously lit by lamps at night! 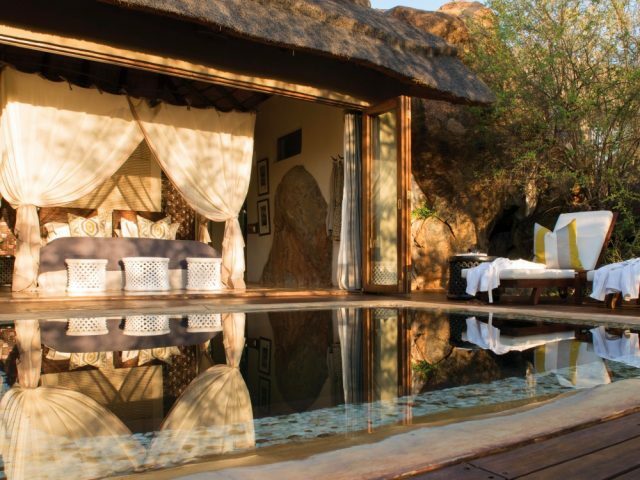 We’re a huge fan of all rooms which have private plunge pools and Madikwe Safari Lodge certainly delivers on that front! The Lelapa lodge is very child- friendly and hosts a variety of children's activities such as bush orientation and skills – a great place to come with the kids! Located in a very good area for game viewing in the north of the reserve – hopefully you’ll be lucky enough to spot one of the park’s famous packs of wild dogs! There’s no swimming pool at the main lodge area – then again that’s not really a major issue given that each suite boasts its own plunge pool! 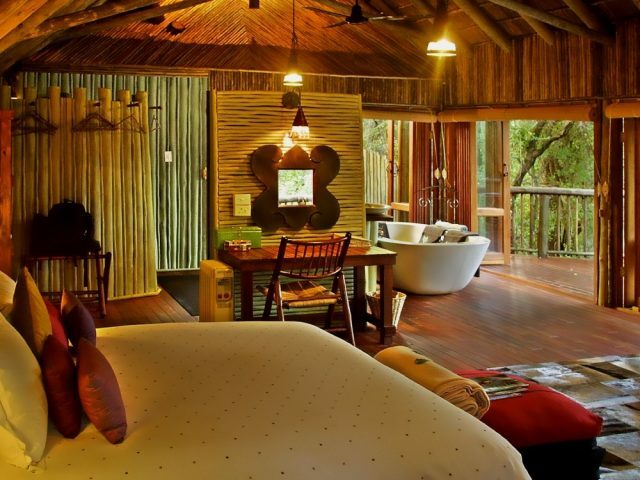 a lodge which seems to ooze the essence of “bush lodge” out of its every pore! Take the way the thatched roof of the lounge is held up by wonderfully twisted and textured old tree trunks hung romantically with paraffin lamps at night! Increasingly we see new game lodges that look like they could be just as much (if not more) at home perched above Camps Bay beach – they’re all about minimalism and clean contemporary design and the fact that they are actually located in the bush is almost accidental. Madikwe Safari Lodge is not like that at all. In fact it’s just about the complete opposite! 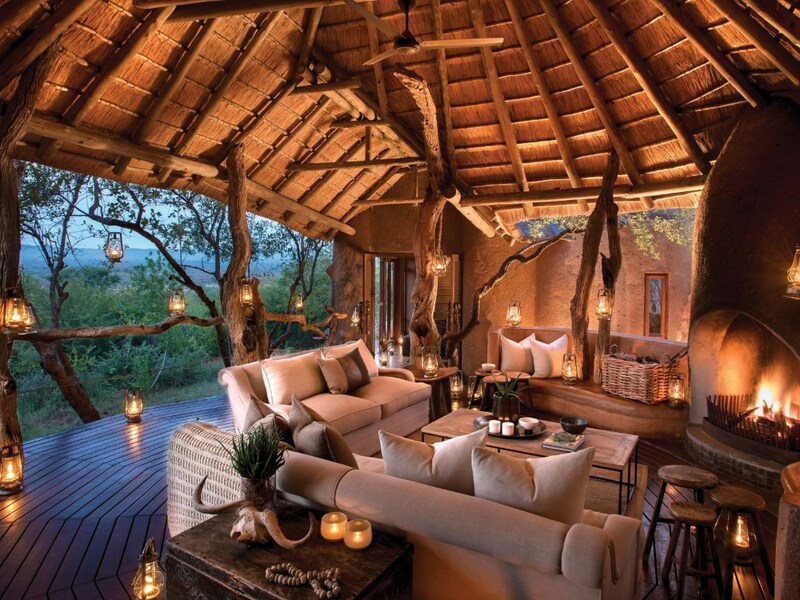 This is a lodge which seems to ooze the essence of “bush lodge” out of its every pore! Take for example the stunning thatched open lounge and deck area. Whilst most lodges would have the thatched roof held up by regular gum poles, Madikwe Safari Lodge makes use of old tree trunks to do the job – they’re wonderfully twisted and textured and add a gorgeously natural organic style to the area, especially at night when paraffin lamps are hung off them to create a hugely romantic ambiance! 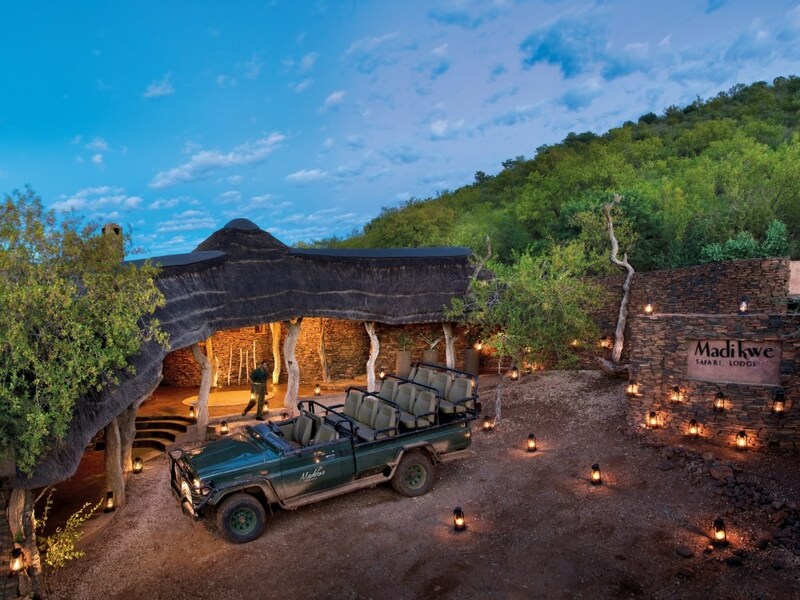 Madikwe Safari Lodge is in fact 3 separate mini-lodges all located on the same hillside in the north of the Madikwe reserve close to the Botswana border. There’s the main lodge, Lelapa meaning “family” whose 12 suites make up the central, family friendly area of the lodge as the name suggests. Then nearby there are the 4 suites of Kopano (meaning “small gathering”) which is perfect for a group of friends or family. Finally further up the hill we have another 4 suites making up Dithaba (or “mountain”) which boasts incredible views and is also suited as an exclusive use area. The beauty of the set-up here is that the lodge has huge flexibility in terms of being able to accommodate guests according to their needs – but for our purposes most of our guests are likely to stay in Lelapa – the main “family lodge”. The authentic African feel carries over to the rooms here too – for example check out the use of woven baskets as décor items. We especially love the way that the suites avoid sharp angles and straight lines wherever possible – instead they’re all about soft organic curves that make for a wonderfully relaxing space to be! They’re also extremely comfortable being both very spacious (they’re 100 m2 in total split equally between the room itself and the private outside deck) as well as being very luxurious. Whilst you’ll no doubt enjoy the cooling air-con in summer, what we really love is that all of the suites have their own fireplace – there’s nothing like returning after a chilly evening game drive to cuddling up in front of a crackling fire with your better half! The good news doesn’t end there either as each of the suites has its own private plunge pool out on the deck whilst you also get to enjoy both indoor and (our favourite!) outdoor showers! The lodge is family owned and operated which is always something that we enjoy as this involvement is usually tangible in the guest experience and is what gives the lodge so much of its soul! The exciting thing is that the Brews family have now partnered with the More family (of Lion Sands fame) so the lodge is able to really able to deliver a superior bush experience. This also extends as far as the game viewing. The lodge is located in an excellent area for game, right in the north of this 75 000 hectare reserve close to the border with Botswana. 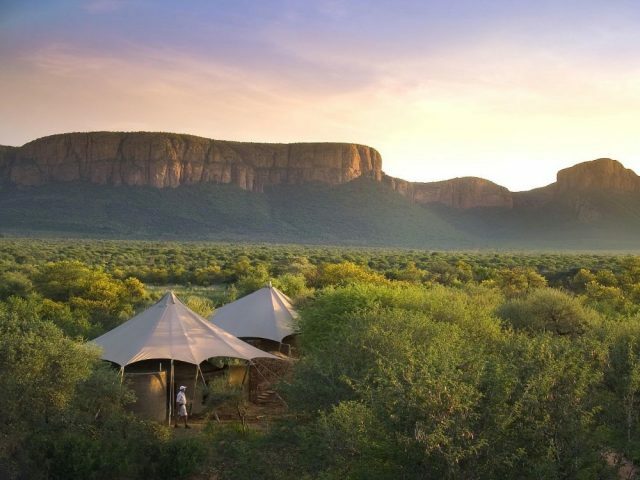 Guests consistently rave about the quality of the rangers at Madikwe Safari Lodge and you’ve got a decent chance of seeing the Big Five as well as one of Madikwe’s rare specialities – the endangered wild dog! Leopard sightings in Madikwe have always been a topic of discussion but the sightings are becoming a lot more frequent as they are becoming more relaxed with the presence of vehicles in the area. As you can imagine from the name, Lelapa is very much a family friendly lodge - the staff know and understand what an unforgettable experience it is for children to be in the bush and go out of their way to make both you and your kids feel at ease with plenty of children’s activities on offer! They’ll be kept enthralled by things like learning which tree to use to make a toothbrush or which trees have edible properties, as well as how to make fire and find water! If we had to nit-pick then it’s a pity that Lelapa doesn’t have a communal pool at the main lodge area, but that’s really not a major given that each of the rooms have their own plunge pools! A Madikwe Guest Conservation Contribution Fee of R150 per adult per night & R75 per child per night applies. The fees are subject to change and are to be settled at the lodge direct.